If many of their rivals at the time were more clinical in their approach to interpreting music, Hungary's Regőczy and Sallay were anything but. Full of vim and vigor, the duo steadily moved their way up the ranks from thirteenth in their first Worlds appearance in 1973 to third in 1978, second in 1979 and first in 1980, where they overtook Natalia Linichuk and Gennadi Karponosov, the Russian duo who had defeated them at the 1980 Winter Olympics in Lake Placid. An upset in ice dance? Say it isn't so! The team turned professional after their 1980 upset at Worlds and went on to also win that year's World Professional Championships alongside teammates Robin Cousins, Linda Fratianne and Tai Babilonia and Randy Gardner. They won the 1982 World Pro title as well, skating to "Bolero" before Jayne Torvill and Christopher Dean in fact did. Today, Sallay is the managing director of IMG Hungary and Regőczy is the figure skating sports director for the ISU. At the age of nine in Vienna, Felix Kaspar began his figure skating career. After winning the 1937 European and World titles and the 1938 European title, Kaspar would bravely travel to the heart of Nazi Germany in 1938 (right before the onset of World War II) and take the title. This was no small feat considering he as an Austrian was competing on German soil at a politically charged time and the referee of the panel in the men's event and one of the judges were both German. Nevertheless, Kaspar was an exceptional jumper and was able to move up from a second place finish in the school figures to win the free skate. To give you an idea about just how impressive Kaspar's jumps were, Maribel Vinson, writing in The New York Times in 1937, said his jumps measured as much as four and a half feet high and nineteen feet long. Shortly after winning his second World title, Kaspar fled the volatile region to safety in Australia where he met his wife. He took up coaching in 1940 and later moved to the U.S., where he coached skaters like Japan's Emi Watanabi and 1963 U.S. Men's Champion Tommy Litz. Kaspar later returned to Europe (even Germany in fact) to perform in shows and opted to retire from coaching in 1989. He moved with his wife June to Florida, where he enjoyed tennis and golf until his death after living with Alzheimer's Disease in 2003. 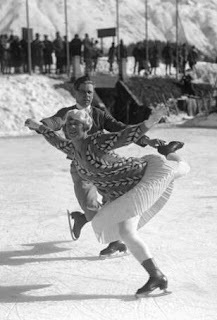 Perhaps best known for winning the silver medal at the 1928 Winter Olympic Games, Austria's Lilly Scholz and Otto Kaiser actually won five consecutive medals at the World Figure Skating Championships culminating in a gold medal in 1929 in Budapest, Hungary. Then twenty five and twenty seven, Scholz and Kaiser defeated two other Austrian teams as well as teams from Hungary, Czechoslovakia and Germany to win their World title. After winning the 1929 World title, Kaiser retired and Scholz (later Lilly Gaillard) went on to win three more medals at the European Championships with her second partner Willy Petter before retiring from competition in 1933. 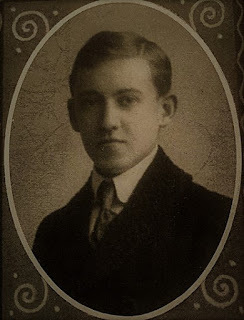 While Scholz' date of death is unknown, we do know that Kaiser passed away in 1977. Although she was born in California, Dianne de Leeuw wisely chose to take advantage of her mother's joint citizenship with the Netherlands and in doing so, still stands as the most recent Dutch skater to win a World title. Success came fast and furious for the young skater. After finishing seventeenth and fifteenth on her first two outings at the World Championships in 1972 and 1973, de Leeuw catapulted to third place at the 1974 World Championships and in 1975 in Colorado Springs (despite losing the free skate portion of the event to Dorothy Hamill) wins in both the compulsory figures and short program assured Dianne de Leeuw the World title. The following year, de Leeuw won the European title, the silver medal at the Innsbruck Olympics and a bronze medal at that year's World Championships. 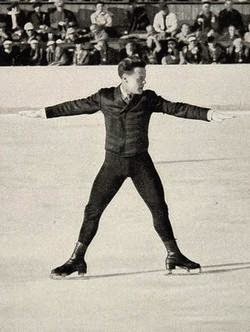 Following the 1976 season, de Leeuw turned professional and toured with both Holiday On Ice and Ice Follies, won the World Professional Championships in 1983 and turned to coaching. Sweden's Gösta Sandahl claimed the European title in 1912 and in his first trip to the World Championships in 1914, he pulled off a major upset in unseating the two time and defending World Champion Fritz Kachler... and the previous year's silver medallist Willy Böckl and bronze medallist Andor Szende to boot... as well his young teammate, as a twenty year old Gillis Grafström. He was a strong free skater and it was his free skate that won him the title, as he'd placed third in the compulsory figures that year. World War I effectively made those World Championships the last for a while but Sandahl survived the war and came back in an effort to defend his glory at the 1923 World Championships in Vienna, however his efforts were good enough for the bronze medal as his former rivals Kachler and Böckl proved unbeatable on his second and final go at the World title. A wonderful photo of Maxi and Ernst donated to NISA by Great Britain's first ice dance champion Daphne Walker. Walker and her partner spent a lot of time training with Maxi and Ernst in Celerina, Switzerland. The original photo (scanned and provided by NISA historian Elaine Hooper) is signed in the original ink. 1936 Olympic Gold Medallists Maxi Herber (an artist who often sketched her skating competitors) and Ernst Baier (an architect) won a total of four World Championships together and seemed poised to go for a second Olympic gold had the 1940 Winter Olympics not been cancelled due to World War II, but their exceptional success together as a pairs team is often overshadowed by their tumultuous relationship off the ice. 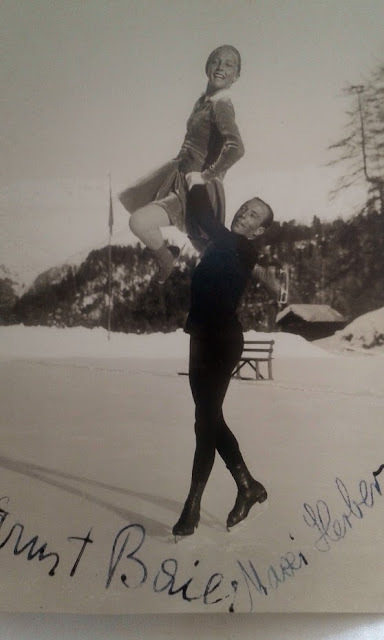 After their "amateur" career ended in 1940, Herber and Baier married, had three children, owned their own business and toured as professional skaters. In 1963 the couple divorced and Herber was left in such a bad position by the divorce she was forced to depend on social services to even survive. She found assistance as well through the Deutsche Sporthilfe (German Sport help organization) and she moved to Oberau near Garmisch-Partenkirchen in Bavaria. In the interim, Baier had married Swedish professional skater Birgitta Wennström and had a fourth child. Baier and Wennström divorced as well... and incredibly even after all of this, Herber and Baier chose to remarry in 1973. They later divorced a second time. Later in life, Herber suffered from Parkinson's Disease and moved to a retirement home where she took up watercolor painting and even gave an exhibit of her work. Baier passed away in 2001 and Herber in 2006. At the time of Maxi Herber's death, she was the oldest surviving German Olympic Champion. Tuesday Double Feature: Review Time!